Looking for Hemingway: Spain, The Bullfights and A Final Rite of Passage by Tony Castro is now available at Amazon.com. What brought you to this subject and then what compelled you to write an entire book on it? I think my lifelong fascination with Ernest Hemingway had its genesis in my youth when an English teacher who had taken a special interest in my insatiable appetite for reading introduced me to The Old Man and The Sea. I quickly found myself devouring that book and in rapid succession every Hemingway short story and novel that I could find – and eventually earned me the reputation of having read every book in my hometown public library in Waco, Texas. The obsession with Hemingway eventually led to an unauthorized visit to Cuba in the 1960s along with a group of Chicano movement activists and members of the Students for a Democratic Society. The revolutionary romance of Fidel Castro’s Cuba had made it a popular destination for the New Left, but I was hardly the political sort. I was an undergraduate at Baylor University, a conservative Baptist college in the heart of the South’s Bible Belt, and through a Latin American studies professor at the University of Texas made the connection of a lifetime. He had known Fidel Castro in Mexico in the 1950s, and he arranged for me a special tour of La Finca Vigía, the Hemingway home in San Francisco de Paula, Cuba. So I guess I was a romantic with a destiny of which I wasn’t even aware. A few years after college, I moved into a writer friend’s house in Houston, which had an unexpected connection to Hemingway. Was it simply an incredible coincidence that my friend’s previous housemate had been Teo Davis, the son of the wealthy American expatriates who had hosted Hemingway in his last two visits to Spain before his suicide? A couple of years later, while on a Nieman Fellowship at Harvard, I shared this story with the two professors with whom I was studying literature – the Mexican writer and future Nobel laureate Octavio Paz and Homeric scholar Robert Fitzgerald. Both urged me to also spend time during my fellowship studying the newly opened collection of Hemingway papers at the John F. Kennedy Presidential Library. Both Paz and Fitzgerald joined me the first time I visited the collection. Fitzgerald bailed on us afterward, but Paz and I closed down the Faculty Club at Harvard that night toasting Hemingway with shots of tequila. Then in the 1980s, in yet one more twist of coincidence, I finally met Teo Davis in Los Angeles where we began a friendship that has spanned over three decades. It was Teo who introduced me to Mike Hamilburg, a literary agent who represented me until his illness and death. 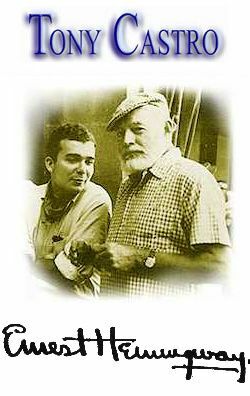 Mike had known Teo for several years, and he tried for well over twenty years to convince Teo to write a book about his experience as a child with Hemingway when he had stayed in Spain at the Davis villa La Consula in 1959. Mike said he didn’t think Teo had ever written a single word, and if he did, I never read a word of it either. Teo didn’t want to write that book or couldn’t. Finally, after years of trying to coax the story out of him, I gave up. It was then that Teo, somewhat relieved that I was going to stop pestering him about his story, said that I should write the story and that he would help as best he could. This book, though, isn’t the book Mike had envisioned Teo writing, nor is it the book I tried to get him to write. That book Teo took with him to the grave. For me, there has always been in the story of Hemingway and Spain an allure so sharp and fresh that there was never any question of writing this book. There has been, from the start, the joy of rediscovering the world in which he walked and traveled, both in the 1920s and again in 1959. Here was a canvas as generous, colorful, and grand as any in Hemingway’s life. As the story pushed forth, there was at every turn the excitement of history never told, of connections hidden for decades, of old mysteries answered. The story of Hemingway the icon was well known. The story of Hemingway the man and his friendship with Bill and Anne Davis at their magnificent home had been buried. Getting that story was slow work. After a good while, I felt I had become the crypt of Hemingwayolé en La Consula. As my patient wife Renee used to say (but seldom aloud – for which I thank her) about this project, great effort went in but nothing came out until now. For me, too, as a child of the 1950s who read The Old Man and The Sea thinking I was the boy Manolin, I suppose I have been looking for Hemingway all my life, and perhaps it seems fitting that I think I have found him at an age when I now see myself in the old man Santiago. Looking for Hemingway is about Hemingway at that age we all dread of being: Old, losing our train of thought, unable to do what once came so easily, too quick to show our frustration at our slowness but still holding on to the hope of one last glimmer of youth. And it is not an easy age to face, especially for publishers. More than a few just flat out said they didn’t think any readers, especially Hemingway fans, wanted to read about him as an old man, pathetic at times, feeble and paranoid. Being a life-long Hemingway lover, I found that hard to believe, unless it’s just simply old age some of us don’t want to face, whether Hemingway’s or our own. For those who fear this life stage, I can only say that I found it inspiring in the research to learn that Pablo Picasso in his sixties was having affairs with gorgeous youthful women more than forty years younger – young enough to be his granddaughters. A dirty old man? Maybe not so dirty if you’re Picasso. A theme in the book is the Lost Generation. Explain why. Hemingway made famous the Lost Generation of post-World War I in Europe — American expatriates thought by many to have been drunkenly decadent, wildly self-indulgent, and irretrievably ruined. It was the cultural backdrop for his breakthrough novel The Sun Also Rises, published in 1926. And it’s a theme not that dissimilar from what emerged in the months of Hemingway’s 1959 visit to Spain. Ernest chased young women as unashamedly in 1959 as he had pursued the beautiful and recently divorced British socialite Lady Duff Twysden in 1925, being as insensitive to Mary as he had been his first wife Hadley back in the mid-1920s. And Hemingway in 1959 behaved almost as badly as he and his entourage did back in 1925. But there were other similarities. A writer who visited the Davis villa in Spain in 1959 said Bill and Annie Davis were “the Gerald Murphys of the fifties, transferred to the new high bohemian playground of the Gold Coast of Spain.” The Gerald Murphys were a wealthy American expatriate couple known for their own lavish soirees on the French Riviera where they entertained writers and artists of The Lost Generation in the 1920s. And this was the exact kind of setting surrounding Hemingway in Spain in 1959. You did a lot of research. Tell us about it. Of course, there were countless interviews with my friend Teo Davis, son of Bill and Anne. But there was a matter also tracking down memoirs, unpublished and published, letters, journals and books, particularly some in Spain. This period of Hemingway’s life was never written about in any depth by anyone but instead it was finding bits and pieces in various sources, mostly in Spain and Paris where the Davises had homes. I was also incredibly fortunate while I was a columnist at the Los Angeles Herald Examiner of being a desk mate to the late Jim Bacon, who was perhaps the most famous print journalist who ever covered Hollywood. He knew a number of people in Hollywood who had known Hemingway and the Davises, people like Lauren Bacall and Orson Welles. Even in the 1980s, as I was playing around with the idea of a book about Hemingway in Spain, Ms Bacall and Mr. Welles were gracious in providing me with their insights. In addition to Hemingway, who was the most compelling figure in the book to you?